As a dividend growth investor, my goal is to build a portfolio of quality dividend paying companies, that grow dividends over time. My success in achieving that is dependent on amount of savings I can put to work each month, the returns I can generate and the time I allow the investments to compound. I believe that consistently saving a portion of my income is the basic foundation behind my financial independence calculation. However what I do with that money is equally as important, because if I am successful, the amounts I earn from investing will be many times what I would have earned during my lifetime. In other words, if I saved $1000/month for 20 years, I would have ended up putting approximately $240,000. Let’s assume that I invest it all in dividend growth stocks that yield 3% today and grow distributions by 7% annually. Distributions are then reinvested in more companies yielding 3%, which grow dividends by 7% per year. After 20 years, the value of this hypothetical portfolio would be approximately $715,000. It would be earning over $21,500 in annual dividend income. The power of compounding has resulted in a gain of over half a million dollars in net income. This power of compounding was created when earnings were plowed back in the business to maintain and increase profits and have the capacity to increase dividends. 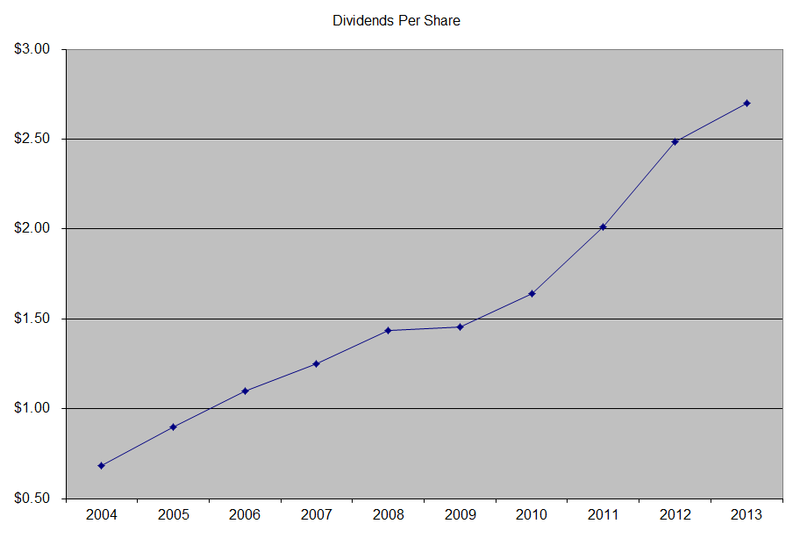 Those increased dividends are then also plowed back to buy more shares, which turbocharges the income growth potential. As you can see, by year 20, the amount of dividends that is earned covers the amount of funds put to work in the portfolio almost by a factor of two. This shows that consistent compounding of capital and dividend income can result in much more funds that those initially put to work. The amounts put to work are really minuscule relative to the ending amounts, after a period of consistent compounding of capital and income. If you continued compounding for another 30 years, the amounts put would look even smaller, relative to the ending amounts of capital and income. Of course, this goes on to show that even small amounts of money that are left to compound over long periods of time and a consistent rate of return, could mushroom into pretty sizeable fortunes. This is why you should never despise the days of small beginnings, but should start investing as soon as possible. The earlier your start, the more time do you have to compound your capital. For example, if you are 25 years old and you can only afford to put $10,000 to work in dividend paying stocks once, you can do pretty well over a 40 year period. When you are 65, you can end up with a portfolio earning almost $13,800 in annual dividend income. If you are 50 years old, and you want to earn the same type of income at the age of 65, you need to put $114,000 to work for you. You can definitely see with this example that starting as early as possible lets your dividend growth stocks do the heavy lifting for you. I have shared the spreadsheet I used to create those calculations here. For example, one of the largest beneficiaries of the power of compounding is Warren Buffett. He became a billionaire in 1986, at the age of 56. Now, at the tender age of 84, he is worth $58.50 billion. In other words, 98% of this fortune was achieved in the past 28 years. 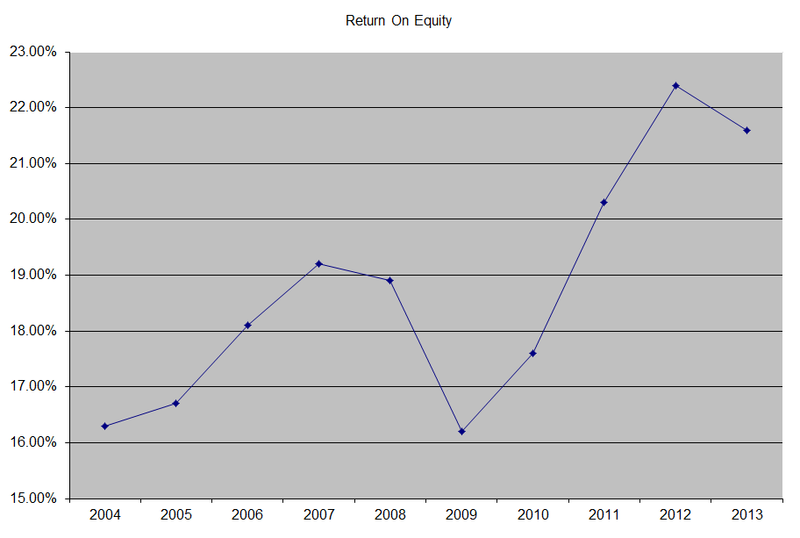 This was mostly done because of the power of compounding. I keep seeing investors that do not understand why it makes sense to buy dividend growth companies that yield only 2.5% - 3% today. What those investors are missing however is really obvious. They miss that those companies regularly manage to grow their dividends, because they are able to increase profits over time. If you start with a 3% yield today, but you grow the dividend by 7%/year for 30 years, you will end up with a stock that pays you a 24% yield on your cost eventually. In other words, if you put $1000 in a dividend paying stock that yields 3% today, but grows those dividends by 7% per year, you will end up with an annual dividend income of $240 in 30 years. This example of course assumes that you spend all the dividends. If you reinvested those dividends into more stock for 30 years, the annual dividend income produced by that dividend machine would be $520 ever year. Altria Group, Inc. (MO), through its subsidiaries, manufactures and sells cigarettes, smokeless products, and wine in the United States and internationally. This dividend champion has managed to raise dividends for 44 years in a row and has managed to grow dividends by 11.40%/year over the past decade. Currently, is trading at 15.80 times forward earnings and yields 4.70%. Check my analysis of Altria. Chevron Corporation (CVX), through its subsidiaries, is engaged in petroleum, chemicals, mining, power generation, and energy operations worldwide. This dividend champion has managed to raise dividends for 26 years in a row and has managed to grow dividends by 10.60%/year over the past decade. Currently, is trading at 11.50 times forward earnings and yields 3.50%. Check my analysis of Chevron. The Coca-Cola Company (KO), a beverage company, manufactures and distributes coke, diet coke, and other soft drinks worldwide. This dividend champion has managed to raise dividends 52 for years in a row and has managed to grow dividends by 9.80%/year over the past decade. Currently, is trading at 19.40 times forward earnings and yields 3%. Check my analysis of Coca-Cola. Exxon Mobil Corporation (XOM) explores and produces for crude oil and natural gas. This dividend champion has managed to raise dividends for 32 years in a row and has managed to grow dividends by 9.60%/year over the past decade. Currently, is trading at 13.10 times forward earnings and yields 2.70%. Check my analysis of Exxon Mobil. Genuine Parts Company (GPC) distributes automotive replacement parts, industrial replacement parts, office products, and electrical/electronic materials in the United States, Puerto Rico, the Dominican Republic, Mexico, and Canada. This dividend champion has managed to raise dividends for 58 years in a row and has managed to grow dividends by 6.20%/year over the past decade. Currently, is trading at 18.50 times forward earnings and yields 2.70%. Check my analysis of Genuine Parts Company. Johnson & Johnson (JNJ), together with its subsidiaries, is engaged in the research and development, manufacture, and sale of various products in the health care field worldwide. This dividend champion has managed to raise dividends for 52 years in a row and has managed to grow dividends by 10.80%/year over the past decade. Currently, is trading at 17.20 times forward earnings and yields 2.80%. Check my analysis of Johnson & Johnson. PepsiCo, Inc. (PEP) operates as a food and beverage company worldwide. This dividend champion has managed to raise dividends for 42 years in a row and has managed to grow dividends by 13.70%/year over the past decade. Currently, is trading at 18.90 times forward earnings and yields 3.10%. Check my analysis of PepsiCo. The Procter & Gamble Company (PG), together with its subsidiaries, manufactures and sells branded consumer packaged goods. This dividend champion has managed to raise dividends for 58 years in a row and has managed to grow dividends by 10.60%/year over the past decade. Currently, is trading at 19.20 times forward earnings and yields 3.20%. Check my analysis of Procter & Gamble. Target Corporation (TGT) operates general merchandise stores in the United States and Canada. This dividend champion has managed to raise dividends for 46 years in a row and has managed to grow dividends by 19.80%/year over the past decade. Currently, is trading at 14.50 times forward earnings and yields 3.10%. Check my analysis of Target. General Mills, Inc. (GIS) produces and markets branded consumer foods in the United States and internationally. 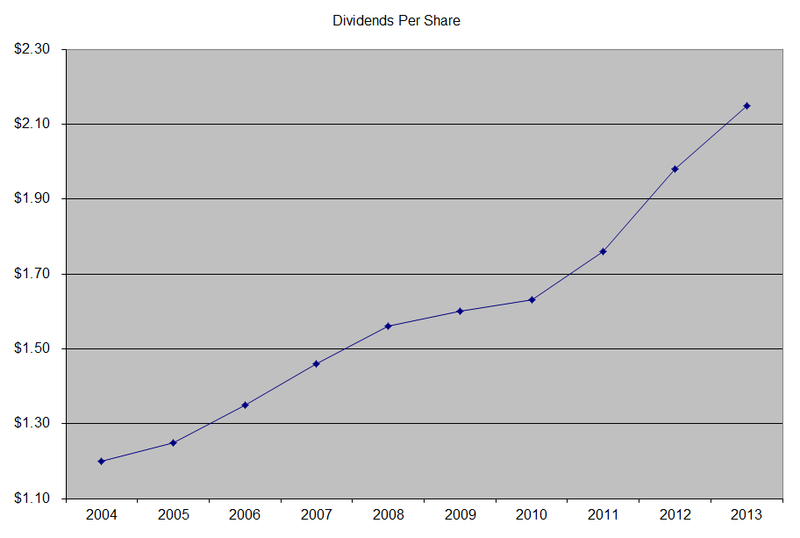 This dividend achiever has managed to raise dividends for 11 years in a row and has managed to grow dividends by 10.80%/year over the past decade. Currently, is trading at 18.70 times forward earnings and yields 3%. Check my analysis of General Mills. Eight of these companies are dividend champions whose annual dividend growth rate exceeded 6%/year over the past 1, 3, 5, and 10 years, yield as above 2.50% and selling for less than 20 times earnings. The last one is a dividend achiever, which I am trying to build a sizeable position in over the next couple of years. To summarize, savings is important to get you started in investing. However, at some point, the power of compounding is a much stronger and more powerful driving force that would help you achieve your dividend income objectives. This is why it is important to start investing as early as possible, in order to allow your capital maximum amount of compounding time. As they say, it is time in the market that truly counts, not timing the market. Imagine that you have two companies that are selling for the same valuation, which are also in the same industry and have similar current yields. Both companies would be characterized as “quality dividend paying ones”, as they each have strong branded products that consumers buy, good pricing power, and opportunities for growth. Coca-Cola (KO) and PepsiCo (PEP) fit my idea of what a quality dividend growth company is. The question to answer is, if you wanted to buy the shares in just one of the companies, which one would you purchase? For me, the answer is always to look for the one with the higher growth potential. It is a no brainer decision to select the company with the highest expected growth, particularly if the valuations are similar. In reality however, investor expectations are just that, expectations. They do not become tangible fact, until enough time has passed in order for you to determine if those expectations occurred or not. In other words, if I expect Coca-Cola to double earnings per share every decade for the next 30 years, I would have to wait until 2044 until I can say if my expectation was right. One can expect a lot of things changing from now until 2044, many of which might not be even comprehensible for someone thinking about the future in 2014. Therefore, in my stock selection process, I focus on the quantitative factors and the qualitative factors, but I always try to leave room for error. This is why I never really put exact fair values on stock prices, based on coming up with a future growth rate, and then discounting it back. At the end of the day this method could provide the investor with a fair value and a premium or discount relative to current prices for companies they are analyzing. However, this method would also provide you with a precise numbers, which in reality are just an illusion that is dependent on investors assumptions. If you change your assumptions, and the “precise numbers” changes as well. This is why I merely bump companies against each other, and select the ones that look best. I described how I compare between dividend companies in a previous article. The precision behind those fair values is an illusion that is derived from making expectations on future growth rates in earnings or dividends, and discounting them back using an estimated rate. I believe that investors who only look at that are essentially outsourcing their ability to think critically to a formula. Instead, I believe that the better way to do things is to keep it simple. If you have companies with similar valuations but higher growth rates, you might want to go for the growth one. However, you might also decide to hedge your bet and purchase the lower growth one, just in case. It doesn’t make sense to make a lot of projections, do excess calculations, and discount those amounts to the present, when you can merely compare the expectations at the same levels of valuations and be done with it. However, if you can find a company that sells at a lower valuation, and can still provide consistent growth, I would say you might have found yourself a winner. In the case of Coca-Cola versus PepsiCo, I would say both companies might be good acquisitions today, even if one has different growth expectations behind each. For example, Coca-Cola (KO) sells for 19.40 times forward earnings. The company yields between 3% and has a five year dividend growth rate of 8.10%/year. The ten year dividend growth rate is 9.80%/year. In comparison, the company has managed to grow earnings per share by 7.90%/year in the past decade. Check my analysis of Coca-Cola. PepsiCo (PEP) sells for 18.90 times forward earnings, yields 3.10%, and has a five year dividend growth rate of 7%/year. The ten year dividend growth rate is 13.70%/year. 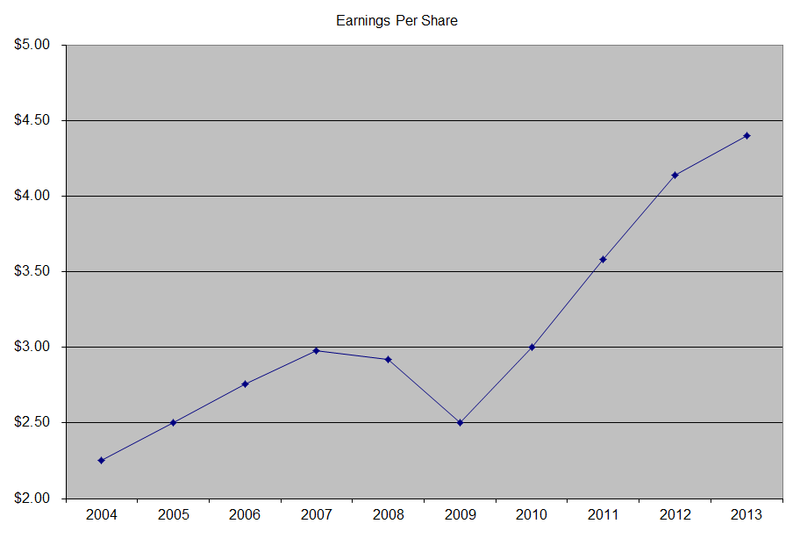 In comparison, the company has managed to grow earnings per share by 7.70%/year in the past decade. Check my analysis of PepsiCo. I also believe one needs to do the actual work in looking at companies, researching past data, and making some assumptions about the future. However, as we know that assumptions are tough to figure out exactly in advance, it is important to try and focus on best valuations available at the present time. 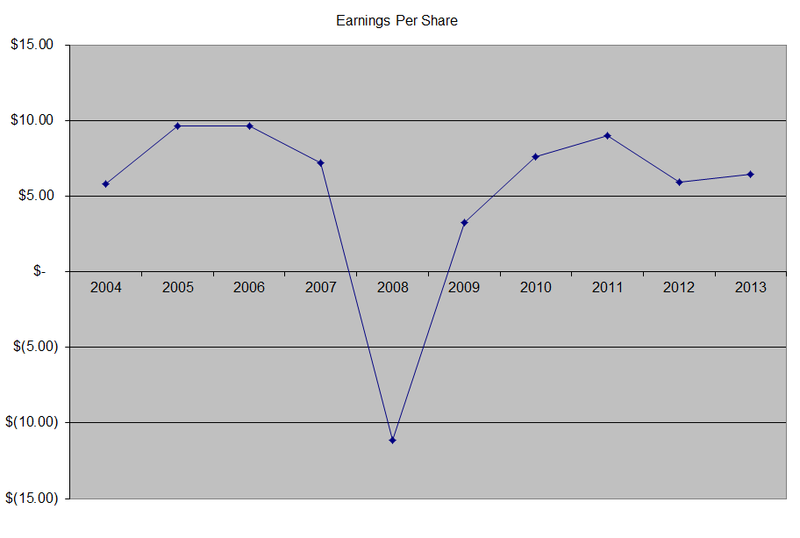 This could be evidenced by a low price to earnings ratios for example. After all, sustainable earnings per share, coupled with a moderate but consistent growth in those earnings per share will result in quiet but sure compounding of wealth and dividend income over time. In other words, why swing for the fences, chasing a percent in yield or growth, when you can do reasonably well and protect and grow wealth and income? The risk in chasing growth at any price is that if growth does not materialize, you may be stuck holding on to a company that doesn’t deliver much in dividends and dividend growth, while your capital contracts in value. In contrast, for a company with a dependable earnings and dividends growth, purchased at an attractive valuation, a decline in growth would not affect an investor as badly. For example, if you purchase a company that yields 2% and grows dividends at 15%/year, you might do well for many years, while getting an increasing yield on cost. However, if growth slows down, you might be left holding a low yielder without the benefit of fast growth. In comparison, a 3% yielder that grows by 7% is not too bad of a choice, even if growth drops to say 3- 4%, because the yield is sufficient to cover a higher portion of expenses in retirement. Of course, those growth rates are not known in advance, as only the yield is locked at time of purchase. However, even assumptions about its sustainability are subject to folly as well. In reality, each company will have different yield/growth characteristics, which is why you need to assemble a diverse portfolio of quality businesses, purchased at attractive valuations. That safety in numbers can be very beneficial in guarding the investor against folly. I have chased high yielding stocks before, and have gotten burned in the process. I have also chased high dividend growth stocks which stopped raising dividends as fast. But by assembling a mix of the three types of dividend growth stocks I focus on, I ensure that my diversified portfolio can withstand different pressures on its components, and still provide me with the growing income in retirement. - Should I buy more high yielding stocks in order to retire early? ConocoPhillips (COP) explores for, develops, and produces crude oil, bitumen, natural gas, liquefied natural gas, and natural gas liquids worldwide. This dividend achiever has paid dividends since 1934 and has managed to increase them for 13 years in a row. The company’s latest dividend increase was announced in July 2013 when the Board of Directors approved a 4.50% increase in the quarterly dividend to 69 cents /share. The company’s peer group includes Exxon-Mobil (XOM), British Petroleum (BP) and Royal Dutch Shell (RDS/B). Over the past decade this dividend growth stock has delivered an annualized total return of 13.80% to its shareholders. The company has managed to deliver a 6.20% average increase in annual EPS over the past decade. ConocoPhillips is expected to earn $6.28 per share in 2014 and $6.17 per share in 2015. In comparison, the company earned $6.43/share in 2013. ConocoPhillips does not have a record of consistent share repurchases. Between 2007 and 2014, the number of shares decreased from 1.646 billion to 1.24 billion. ConocoPhillips is forecasting growth in production in the range of 3% - 5%/year through 2017. This would be driven by the company’s 16 billion annual capital expenditures plan. The goal is to reach a reserve replacement ratio of 100%. The growth areas include Australia’s LNG project, Lower 48 growth in the US, North Sea, Malaysia and Canadian Oil Sands operations. The nature of the oil business is such, that for every barrel of oil pumped out of the ground, your reserves decrease by one barrel. With advancements in technology however, it is possible to obtain more oil from existing and new wells than before. In addition, oil and gas companies spend large amounts of money on seismic activity studies, in order to increase their chances of striking oil. Over the past four years, the company has sold off a lot of assets, raising billions of dollars in the process. Examples include selling off its stake in Lukoil, and selling off its stake in the Kashagan project in Kazakhstan. In addition, the company spun-off its downstream business Phillips 66 (PSX) in 2012 to shareholders. The reason why ConocoPhillips appeals to me is the fact that most of its oil and gas production is derived from stable places such as US, Canada and Europe. Places in Asia Pacific, Middle East and Africa accounted for just 19% of oil and 12% of NGL and 21% for Natural Gas. Given the rise in nationalist governments that are not friendly to foreign oil companies, the location of majority of producing wells in stable countries makes it much less likely that those would be nationalized. In addition, management is focused on growth through high-margin projects, and does not focus on growth for growth sake. It is good news for me as a shareholder to have a management team which focuses on maximizing owner returns by pursuing higher margin projects, and disposing of lower margin ones..
A 6% growth in distributions translates into the dividend payment doubling every twelve years on average. This dividend amount is adjusted for the spin-off of Phillips 66 in 2012. If we check the dividend history, going as far back as 1989, we could see that ConocoPhillips has actually managed to double dividends every eight years on average. 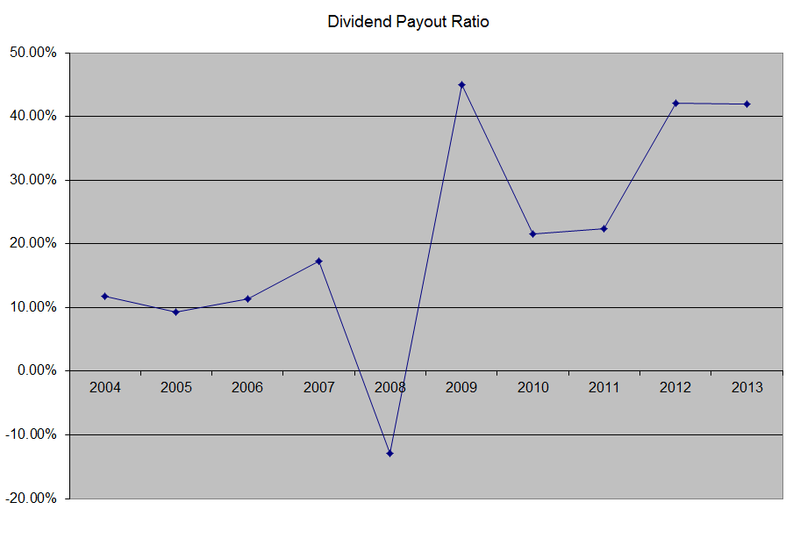 The dividend payout ratio has increased from 12% in 2004 to under 42% by 2013. A lower payout is always a plus, since it leaves room for consistent dividend growth minimizing the impact of short-term fluctuations in earnings. 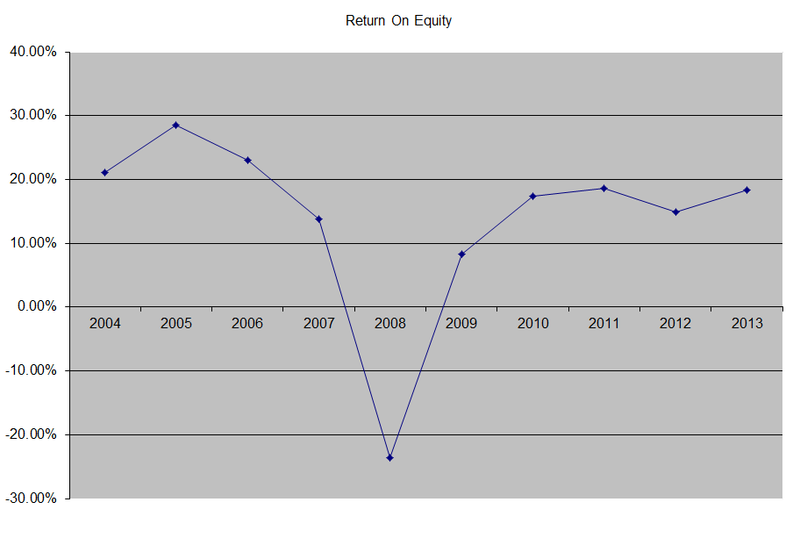 The return on equity has decreased slightly from 21% in 2004 to 18% in 2013. Rather than focus on absolute values for this indicator, I generally want to see at least a stable return on equity over time. Currently, the stock is attractively valued, as it trades at a forward P/E of 12.40 and yields 3.50%. I would consider adding to my position on dips, and subject to availability of funds. - Why Investors Should Look Beyond Typical Dividend Screens? Investors spend a large portion of their working years accumulating a sizable nest egg, that will support them in retirement. Once they approach the age to retire however, investors are typically sold on asset depletion strategies such as the four percent rule, which rely on selling off assets in order to meet expenses. Selling off assets to pay for expenses in retirement is akin to cutting off apple trees for lumber, instead of harvesting the fruit and living off the income from it. The issue with selling off assets is that there is a higher logical risk that once investors run out of assets to sell, they would have no other source of income other than their labor. Instead, dividend investors focus on generating income from their capital in the form of dividend or rent income that lasts in perpetuity. As a result income investors would be able to create their own retirement paychecks from the income generated by their investments. As a result, they would not be dependent on market volatility to generate the income in retirement they need. Investors should avoid overpaying for stocks, since this could bring down their long-term returns. Investors in US stocks in early 2000s were willing to paying high multiples, given the rosy outlook for the economy and tech stocks. Even some quality companies such as Johnson & Johnson (JNJ), Wal-Mart (WMT) and Coca-Cola (KO) were selling at unsustainable valuations. The subsequent twelve years of flat returns served as a strong reinforcer to investors that overpaying even for quality dividend growth stocks could lead to sub-par returns. It makes sense that when you pay 40 - 50 times earnings and you lock in a current yield of 1% or less, you are not going to earn a lot in dividend income even if distributions double every 6 - 7 years. Many novice investors tend to focus exclusively on dividend yield when choosing investments. As a result, they tend to ignore factors such as dividend sustainability as well as corporations ability to maintain and grow distributions over time. Many investors who focused on high paying bank stocks in 2007 – 2008 were burned in the process, as many financials had to cut distributions to shareholders in order to raise money and remain solvent. Investors should perform a detailed analysis of companies they plan on investing in, before they put their hard earned capital to work. By analyzing the company’s business model, and how it earns money, investors should be able to determine whether it can afford to grow earnings in the future. Over time, the potential for an increase in earnings will determine whether a company can afford to grow distributions or not. Most companies that have been able to raise distributions for decades tend to have strong brand recognition, which have allowed them to maintain purchasing power with customers, who are willing to pay a higher price in order to obtain the quality product or service. In their quest for generating income off their portfolios, investors should focus on companies which have the ability and willingness to pay higher distributions. Companies that have managed to boost distributions for at least ten consecutive years, have achieved this by properly balancing the need to expand with the need to avoid diworseification by distributing excess cash flows to shareholders. Companies which generate so much in excess cash that they do not know what to do with it, after funding their business expansion plans, are very likely to keep paying and increasing distributions to loyal shareholders. Investors, who plan to generate a defensible income stream, should avoid putting all of their eggs in one basket. A portfolio consisting of at least 30 individual securities representative of as many sectors in the economy as possible, has a much better chance of ensuring that the dividend stream will continue uninterrupted for the long run. While currently it looks like a no brainer to focus on high-yielding master limited partnerships yielding 6%, past experience should note that overcommitting to a sector could be dangerous to your financial health. Investors who were overweight financial sector in 2007, suffered steep losses in the capital and dividend incomes, as the financial crisis of 2007 – 2009 exposed weak balance sheets and companies cut distributions. Investors, who follow these five simple principles, will be able to not only generate a sustainable amount of income from their nest eggs, but also grow cash distributions to compensate for inflation. By living off income from their investments, these future retirees would be able to have a sustainable income stream that would be entirely dependent on the underlying investments financial performance rather than stock market gyrations. McDonalds Corporation (MCD) franchises and operates McDonald's restaurants in the United States, Europe, the Asia/Pacific, the Middle East, Africa, Canada, and Latin America. The company has increased dividends for 38 years in a row and has a five year dividend growth rate of 13.90%/year. This dividend champion sells for 17.90 times forward earnings and yields 3.10%. Check my analysis of McDonald's. Chevron Corporation (CVX), through its subsidiaries, is engaged in petroleum, chemicals, mining, power generation, and energy operations worldwide. The company has increased dividends for 26 years in a row and has a five year dividend growth rate of 9%/year. This dividend champion sells for 11.50 times forward earnings and yields 3.50%. Check my analysis of Chevron. Aflac Incorporated (AFL), through its subsidiary, American Family Life Assurance Company of Columbus, provides supplemental health and life insurance products.The company has increased dividends for 31 years in a row and has a five year dividend growth rate of 8.10%/year. This dividend champion sells for 9.90 times forward earnings and yields 2.40%. Check my analysis of Aflac. General Mills, Inc. (GIS) produces and markets branded consumer foods in the United States and internationally. The company has increased dividends for 11 years in a row and has a five year dividend growth rate of 11.50%/year. This dividend achiever sells for 18.70 times forward earnings and yields 3%. Check my analysis of General Mills. Altria Group, Inc. (MO), through its subsidiaries, manufactures and sells cigarettes, smokeless products, and wine in the United States and internationally. The company has increased dividends for 44 years in a row and has a five year dividend growth rate of 9.20%/year. This dividend champion sells for 15.80 times forward earnings and yields 4.70%. Check my analysis of Altria. The Clorox Company (CLX) manufactures and markets consumer and professional products worldwide. Last week, the company increased quarterly dividends by 4.20% to 74 cents/share. This marked the 37 consecutive annual dividend increase for this dividend champion. It was a disappointing increase however, which is much lower than what I am expecting. This is also the slowest dividend increase since 2006, when dividends were raised by 3.60% to 29 cents/share. I still like the company, and would continue holding onto the stock I own, based on my original analysis of Clorox. However, I would not be adding to the company in the near future, because the annual dividend growth is lower than my 6% annual dividend growth target. In addition, the stock is trading at the top of my acceptable valuation range of 20 times earnings, although the yield at 3.20% is pretty decent, and sustainable for the time being. The company earned $4.32/share in 2013, and is expected to earn $4.33/share in 2014 and $4.50/share in 2015. I also do not like the fact that revenues have increased from $4.324 billion in 2004 to $5.623 billion in 2013, but total net income went from 549 million to 572 million. Earnings per share went from $2.56 in 2004 to $4.30 in 2013, mainly due to massive share buybacks in 2005 and 2006. Those share buybacks resulted in negative book values per share, which are scaring novice investors. Many investors are thrown off from the supposed high debt levels for Clorox, but I am not seeing any reason for worry. The company could easily pay off all of its long-term debt within less than 3 – 4 years based off its free cash flow. Of course, in the current low yield environment, the incentive is to lock in those ridiculously low rates, not repay debt with cash that can deliver higher value to shareholders or by reinvesting in the business. The chart below teaches one important lesson for dividend growth investors. The lesson is that dividend growth rates can fluctuate over time, and are not going to be consistent every single year. It is important to understand this, in order to avoid having unreasonable expectations. It is also important to note that one should not panic and sell, because of one or two years where the dividend is not increased fast enough. Year over year dividend growth can be lumpy, yet the ten year average growth could turn out to positively surprise investors. There were nine quarters between 2000 and 2002 and six quarters between 2003 and 2004, where dividend payments were unchanged. 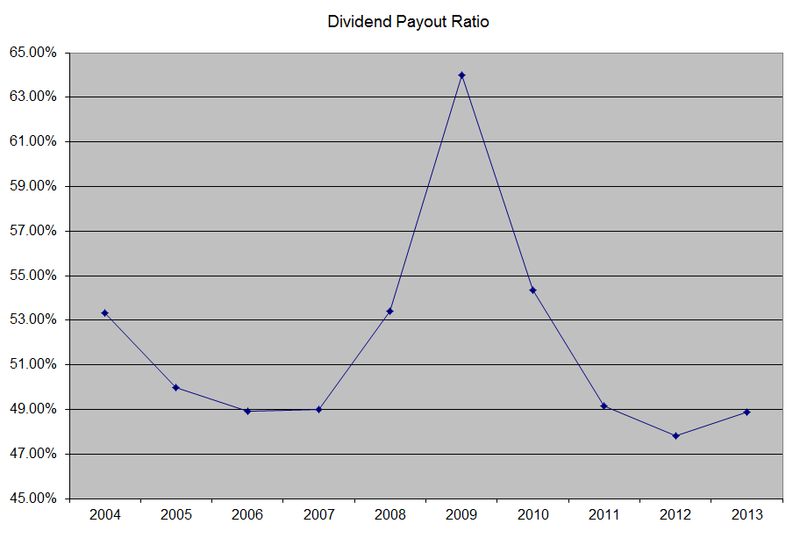 Despite this, annual dividend payments still increased every year during that period. However, investors who panicked and sold because they didn’t like the freeze missed out on a dividend that almost tripled.